The Selection tab allows you to select which values should be included in the log. The window below corresponds to the following circuit. The tab is divided into three vertical areas. The first (leftmost) is a list of all components in the circuit whose values can be logged. Among the built-in libraries, the following types of components support logging. For components which have labels associated with them, their names correspond to the labels; other components' names specify their type and their location within the circuit. Any subcircuits will also appear in the list; they cannot be selected for logging, but eligible components within them can be. 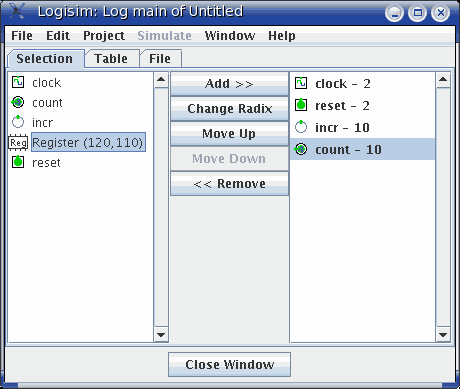 Note that the RAM component requires you to choose which memory address(es) should be logged; it allows logging only for the first 256 addresses. The last (rightmost) vertical area lists those components that have been selected. Also, it indicates the radix (base) in which the component's multi-bit values will be logged; the radix does not have a significant effect on one-bit values. The middle column of buttons allows the manipulation of the items within the selection. Add adds the currently selected item(s) on the left side into the selection. Change Radix cycles the radix for the currently selected component in the selection between 2 (binary), 10 (decimal), and 16 (hexadecimal). Move Up moves the currently selected component in the selection forward one spot. Move Down moves the currently selected component in the selection back one spot. Remove removes the currently selected component in the selection.